Shortly after the completion of the construction of the second city-sanctioned Tuff Shed compound under the I-980 freeway at Northgate Avenue and 27th Street in April, the city of Oakland began evicting residents from the largest encampments in the surrounding area. Over the course of four days in May and June, the residents of 50-plus tents and shanty structures were forced out. It appears the encampments around the sanctioned compounds are cleared of residents to give the outward appearance that one has been replaced with the other. Oakland officials would have the public believe that evicted residents all find a temporary home in the sanctioned compound, but the city greatly oversells the benefits of the sheds and has no comprehensive long-term housing plan. The city of Oakland now has two Tuff Shed compounds — surrounded by barbed wire with guards posted at the entrances — the new Northgate compound and the first at Castro and 5th Streets. The compounds, officially called “Outdoor Navigation Centers” by the city, do not provide enough space for everyone who is evicted the encampments surrounding them. Each holds twenty sheds, with one shed purportedly capable of providing temporary shelter for two people, if folks double up, yet the populations of houseless folks in surrounding encampments were much larger than forty people. Many encampment residents are not willing to take the risk and make the sacrifices required to move into a Tuff Shed. Some refer to them as "concentration camps." Those who do choose to move into a shed must relinquish most of their personal possessions. If Operation Dignity, the organization being paid hundreds of thousands of dollars to maintain the sanctioned compounds, does not find more permanent housing for those living in the sheds, and Operation Dignity doesn't for the vast majority, residents are back out on the street, forced to rebuild their lives from scratch. Transitional housing offered after a stay in a sanctioned compound has a 90-day time limit. Inside the first compound, numerous issues have been raised by residents. 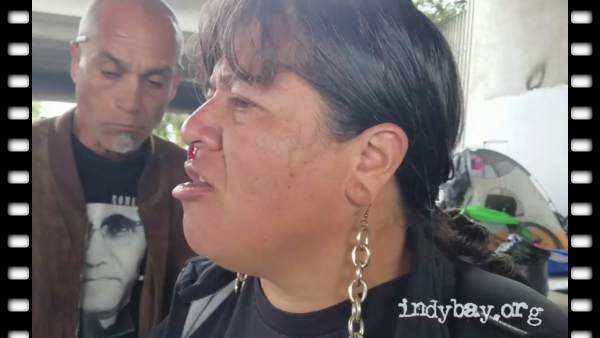 Community housing activists say Tuff Shed residents are regularly left without the water and food that is supposed to be provided by Operation Dignity. Sometimes electricity or food is denied as collective punishment for the actions of a few. Disturbingly, mayor Libby Schaaf brags that Oakland has found private funding for the sanctioned compounds, not spending city funds, as if it is a good thing that the city views assisting homeless Oaklanders as unworthy of public financial support. It also brings into question what strings come attached with these donations. Are the donors asserting influence over the direction of the city's policies regarding the homeless and encampments? Meanwhile, it's not just encampments surrounding the two “Outdoor Navigation Centers” that have been evicted. Oakland regularly forces other unhoused folks to move, destroying their encampments, on seemingly arbitrary rationales and timetables. Those living on the south side were evicted on May 8 and those on the median on May 22. It's the job of Joe DeVries, Assistant to City Administrator, to make it seem like the city has a real plan for permanent or even temporary housing besides just continually pushing people around. When advocates for the houseless are present at evictions, DPW moves slower through encampments, allowing residents of each tent or structure a little more time before plowing through whatever remains. §How many thousands of tents has the city of Oakland destroyed in its never-ending war on the homeless? This tent may have been the property of someone who moved into a Tuff Shed. That person will have no tent or bedding to return to if permanent housing is not found. One of the reasons cited by the city for the clearing of the entire Northgate encampment is the safety of the folks living on this curve at the I-980 offramp. On January 1, 2017, a car being chased by CHP did flip over and smash through a number of the tents on this stretch of sidewalk, fortunately only injuring one man. In November 2017, two pedestrians were killed by a car on Northgate. Tents on Sycamore Street are largely out of view from commuters arriving in Oakland via the 980 offramp. Numerous residents from the evicted areas of the Northgate encampment moved to Sycamore which is now more crowded.